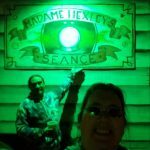 Harvest of Horror SC is a Haunted Attraction located in Anderson, SC. 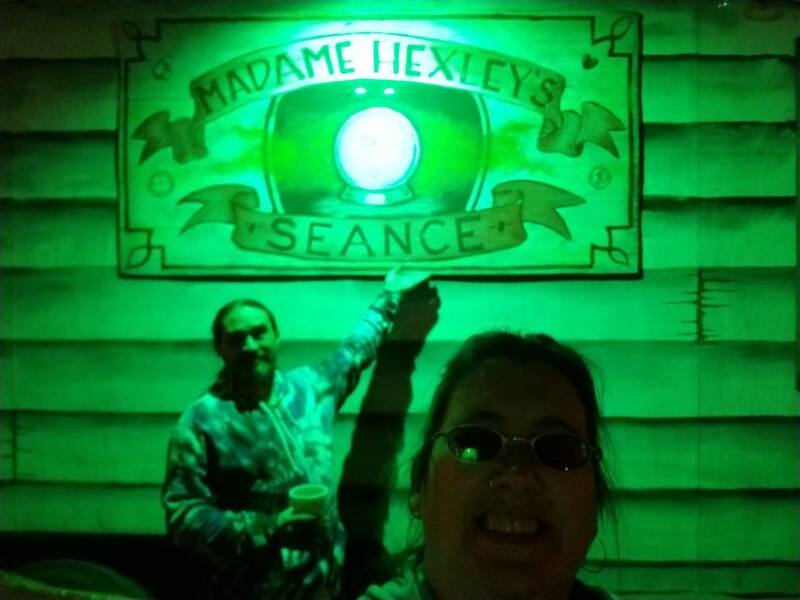 Team Jefferson Starship reviewed this Haunted Attraction on October 21, 2018. The Harvest of Horror (HoH) out at Denver Downs Farm north of Anderson, South Carolina, makes a new appearance this year. Although this is a relatively young haunt in the upstate, the owner and staff of the HoH have nonetheless planted the seeds for a growing and exciting venue suitable for all ages. 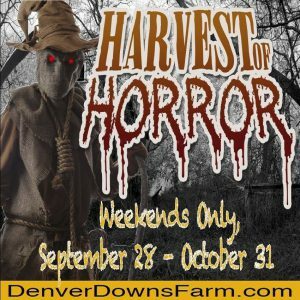 Denver Downs itself provides a huge variety of harvest and farm themed events, all of which are available with your haunt ticket. The addition of these events, even though they are not haunt related, adds tremendous value to the ticket price. It is possible to come early in the evening, purchase tickets, play on the dozens of attractions, leave for dinner (or drop off your young children) and then return (with the same ticket!) to visit the haunt itself. If you don’t have a place for the kids to go, HoH offers a Scare-Light option – a glow-stick necklace that sheds enough light to warn the monsters to stay back (just a little). 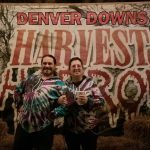 The only way to the haunts (all four of them) is through the Denver Downs attractions, and your ticket includes access to them, so come early and take advantage of all that Denver Downs has to offer. Friday and Saturday nights can get quite busy out at HoH; if you’re looking to avoid crowds, try visiting on a Sunday evening instead. Back in the Harvest of Horror itself, you will find four separately themed haunts that surround a carnival midway – the Freakshow (FS), Holiday’s End (HE), the Dark Harvest (DH), and Area 51 (A51). There are some additional attractions in the midway of HoH that require an up-charge – the Clown Lockdown ride (an old fairground experience from years gone by) and Madam Hexley’s Seance (an entertaining and immersive video experience) as well as a small number of carnival-style games. The cast of HoH are a great bunch with some who really stand out. The Dark Harvest is a small corn maze populated with a number of hulking stalkers from a variety of movies. Area 51 is populated both by helpful soldiers and a multitude of monstrous mutant alien things. The Freak Show is filled with, of course, a variety of freaks of nature. Holiday’s End contains a number of figures from a number of holiday celebrations. Although you do avoid crowds on Sundays, like many haunts, HoH seems to have fewer actors on this day as well. While more actors would have been awesome in some locations – we would have liked to see more of the Freak Show for example – the staff does a good job of spreading the haunters they do have around so that every attraction has a good mix of live actors and static props. Very little makeup is used at HoH, but it works well in the instances where it’s employed. All other actors, whether they are clowns or giant rabbits, wear detailed costumes and scene-appropriate masks. Even the staff along the midway are in costume – we especially enjoyed meeting with the fortune teller who read our palms, and the scarecrow ticket taker before the Dark Harvest as both were very well done. In the Freak Show, we enjoyed the makeup on the carnival barker at the entrance and the Queen of Hearts hidden deep inside. You’ll also find old favorites, like Michael Myers, lurking around (keep an eye out!) as well as unique characters like yetis and the creature from the Black Lagoon. When you arrive at HoH, you’ll want to look for the Denver Downs parking. Since the HoH is a part of the larger farm, they share a single large parking area. Similarly, while there is a separate webpage for the HoH, it’s a part of the Denver Downs website. The staff here are friendly and helpful – whether it’s the costumed staff along the midway or the normal staff of the farm. The haunts of HoH are a mixture of indoor and outdoor venues; visitors with mobility issues may want to take that into account. However, we witnessed that the crew at Area 51 took the initiative to push a wheelchair-bound patron through so that he and his wife could concentrate on firing their laser rifles and enjoy the experience fully. There are things you may encounter on the farm – exposed roots, slippery slides, dirt, and gravel – that could potentially cause a spill, but a careful eye and lots of helpful staff should alleviate any worries on that front. When you first enter Denver Downs, there’s not much to give off the feeling that it’s a haunt. You’ll find a variety of games, activities, a huge (10-acre) corn maze, and animals to interact with. A brightly-lit archway ushers you to tractor-pulled hayrides that transport you back to the HoH midway. Once on the midway, however, the frightful nature of the spooky haunts is apparent. From the costumed workers manning the activities, the decorated facades of each of the haunts and the occasional roaming monster, it will be apparent that you’re here for scares. Screams echo over the fields while chainsaws roar in accompaniment and ticket-takers dressed to match the theme of the haunts guarded and provided a glimpse of what awaits you behind each entrance. One area that HoH really focuses on is detail. While the actors, their costumes, and makeup are one example of this, it truly shows in some of the set-design, facade, and prop construction. The shacks in Dark Harvest were wonderfully well done. Area 51 had just the right amount of foggy haze to really make the lasers from the guns show up as beams in the darkness. Countless scenes in Holiday’s End were detailed to an amazing degree. The Freak Show had a number of things that we’ve rarely seen – from a cotton candy explosion (more gruesome than you might think) to a cobweb-filled hall (complete with dangling spider) and a damp, bubble-filled finale. Even things we were familiar with were presented in some new and interesting ways. HoH staff work not only throughout the year but even during the season, to tweak and improve the detail of their haunts. Each year, we’re told, something new is rebuilt or repurposed to make it fresh and exciting for the guests. Each internal haunt at HoH has its own entrance where the internal theme of that haunt spills out to greet guests. Area 51 is an indoor-outdoor, live-action monster shoot. You’ll gear up with laser rifles and hunt down all the monsters within; hopefully you’ll come out the other side intact! The Dark Harvest is a corn maze haunted by movie characters where you’ll get to experience the thrill of being stalked through the dark or stumbling upon a creepy old shack. Keep your eyes peeled and your ears open; the stalkers here like to surround you. 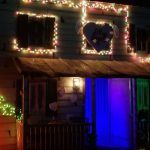 Holiday’s End twists all of your favorite holidays throughout the year into dark and twisted versions that you’re unlikely to expect. The Freak Show which anchors the midway is filled with all manners of strange and exotic sights. 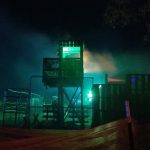 While there are plenty of screams ripping through the nighttime air over the HoH, haunt enthusiasts who visit lots of haunts may be too jaded to do more than react in surprise at the various jump scares scattered throughout the haunts. Area 51 is meant more as entertainment, though you will get some jump scares there while you’re admiring the creepy decor and props. There are a variety of looming, brooding stalkers in the other three haunts, so you’ll find a variety of different types of scares. Each haunt has its own little finale, some better than others. Most of the haunts are relatively short – the longest was under ten minutes – so terrified visitors don’t have to tremble for too long before they reach the midway again. This is a plus if you’re bringing younger children or introducing older ones to haunts for the first time. The intensity of each of the haunts will leave you wanting more, but they are brief enough for even the most scared guest to survive. If you are coming to HoH solely for the haunts, you may be disappointed at their brevity. However, as previously stated, your entrance fee gets you access to dozens of activities at Denver Downs. To neglect to take advantage of that would be a serious waste and a huge mistake. There is a lot of family-friendly fun available for you to enjoy. We hope that as the years go by, HoH continues to add and expand. We’d like to see the midway grow to better reach all of the internal haunts, providing more immersion and interaction throughout. If you’re wanting a family friendly event or a way to introduce someone you know to a love of haunted houses, you won’t go wrong with the Harvest of Horrors! This was my first time there! They details to each Halloween house was great! Lots to do and going …show more back this year!